March 2014 – Reader! Read Faster! Fat Roland, compere of 2013’s visual story night Electric Shorts, hosts this very special evening of commissioned short, short stories for Manchester Histories Festival. 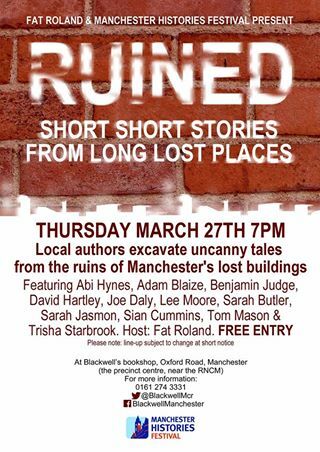 Local authors excavate uncanny tales from the ruins of Manchester’s lost buildings. Expect tales told with humour, pathos and a touch of the uncanny by some of the best performers on Manchester’s live literature scene. It all takes place in a venue filled with books and endless stories. All around us in Manchester, we demolish, yet the voices echo on… arrive early to ensure a good seat! Line-up: Abi Hynes, Adam Blaize, Benjamin Judge, Dave Hartley, Joe Daly, Lee Moore, Sarah Butler, Sarah Jasmon, Sian Cummins, Tom Mason & Trisha Starbrook. THURSDAY 27 MARCH 2014 7.30pm (doors 7pm). Free admission. Blackwell’s bookshop, Oxford Road, Manchester M20 5QB.